Ford expects about 65% of Super Duty customers to opt for the new 6.7L turbodiesel V-8, but the all-new 6.2L gasoline V-8 is no slouch. PRESCOTT, AZ – Ford Motor Co. engineers must take some sadistic pleasure in cooking up new ideas to torture test the auto maker’s line of F-Series Super Duty pickups. During a recent test drive of the upcoming ’11 Super Duty lineup, this maniacal practice is all too evident. Can a diesel-equipped Super Duty pull a 85,000-lb. (38,556-kg) Caterpillar front loader despite the fact its maximum tow-rating, when fitted with a fifth wheel, is 24,400 lbs. (11,068 kg)? Despite seeming implausible, that doesn’t deter the engineers from finding out at a rock quarry here. They wear devilish grins as the throttle opens wide, the truck frame groans for mercy and the wheels hop like a child’s pogo stick against the massive weight. After this tortuous exercise, the front loader has crept about 3 ft. (0.9 m). In another mine-is-bigger-than-yours test, a Super Duty F-550 chassis cab equipped with a flat bed hauls a Dodge Ram 5500 HD up steep inclines. Did we mention the Ram has a multi-ton boulder in its bed? The over-the-top demonstrations are nifty parlor tricks, but they are hardly the type of tasks real-life customers will perform with their trucks. 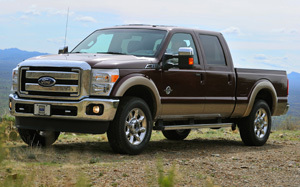 The ’11 Super Duty offers two engine choices: a 6.7L Power Stroke V-8 turbodiesel or 6.2L gasoline V-8. The truck also comes in multiple trim levels (XL, XLT, Lariat, King Ranch), cab configurations (Regular Cab, SuperCab, Crew Cab) and models (F-250, F-350, F-450 and F-550). But most of the attention at this event focuses on the diesel (which was used for the demonstrations), as Ford says close to 70% of Super Duty buyers opt for the oil burner. The ’11 model marks the first year Ford has brought development of the diesel in-house, following the split with longtime supplier Navistar International Corp. The results are impressive. Fire up the new engine and there is little noticeable clatter typically associated with diesels, even modern ones. With the windows rolled up, it’s hard to tell if the engine is even running. Ford engineers have made the diesel purr like a gas engine by using some nifty engineering tricks. The exhaust manifold is moved to the other side of the engine, cutting in half overall exhaust-system volume, reducing noise and heat and improving performance. Additionally, the common-rail, direct-injection system, supplied by Robert Bosch GmbH, delivers up to five injections per intake cycle using 8-hole piezo injectors. At idle, the system relies on two injection events per cycle (instead of one normally), a big contributor to the diesel’s ability to run silent. Even while hauling a trailer weighing over 20,000 lbs. (9,072 kg) up a steep grade, the diesel-powered Super Duty manages the load with little fuss. If not for quick glances in the rearview mirror, we’d be hard-pressed to tell we were towing anything. The diesel’s monumental 735 lb.-ft. (997 Nm) of torque and 390 hp supply the grunt and give the Super Duty bragging rights in the power department until, say, a crosstown rival should deliver even more torque. The Super Duty has plenty of added electronic goodies to make trailering safer and easier. Standard equipment includes Ford’s Trailer Sway Control System, which can determine from the yaw motion of the truck if the trailer is swaying. If swaying is detected, the system corrects it by either applying precise braking or reducing engine torque. An optional integrated trailer brake also is available, allowing drivers to apply brakes to the trailer to stabilize it. But perhaps most impressive is Ford’s Hill Decent Control system. Borrowed from the Ford SVT F-150 off-road performance truck, HDC works with the antilock brakes to control the speed of descent without brake input. The system alleviates concerns the trailer will push the truck downhill. Ford expects about 65% of customers to opt for the diesel, but those who prefer gasoline get the all-new 6.2L V-8, which delivers 385 hp and 405 lb.-ft. (549 Nm) of torque. Mike Harrison, Ford V-8 engine programs manager, says the cast-iron block was designed with durability in mind. The gas engine has plenty of low-end torque, and it achieves its peak by 4,500 rpm due to a SOHC architecture that results in a stiffer valvetrain, allowing optimized cam lift profiles. Great for light duties, such as landscaping, it boasts a top tow rating of 15,000 lbs. (6,804 kg). Both gas and diesel engines are mated to an all-new 6R140 heavy-duty TorqShift 6-speed automatic transmission. Shifting is smooth during our test drives, with the transmission rarely hunting for the correct gear. The transmission’s Progressive Range Select system prohibits upper level gears from being engaged while the truck is heavily loaded or towing on grades, eliminating the potential for high speeds. The Super Duty is designed to be a workhorse, not a daily commuter, so the highway portion of our drive is rough when the bed is empty. But it performs better on the highway than its predecessor thanks to some tweaking of the leaf springs and adjusted spring rate. With so much engineering firepower devoted to the truck’s capabilities, the interior doesn’t get the attention it deserves. The craftsmanship and sturdy materials fit with the rugged exterior. Gaps between interior panels are minimal, and controls are easily accessible and intuitive. The Super Duty borrows its new 10-way power seats from its little brother, the F-150. Available in both cloth and leather, the new seats are soft and wide, able to accommodate customers of broad proportions. Ford touts the interior as an “office on wheels,” citing the vast amount of time most buyers will spend in their trucks while on the job. To accommodate this core consumer group, Ford packs the cab with numerous storage cubbies and a new flow-through middle console that can hold laptops, files, cell phones or whatever else is best kept out of sight. A 110-volt socket and 12-volt powerpoints also are handy for small electronics. The exterior receives a mild massaging rather than a full-fledged restyling. Perhaps the most dramatic addition is the “inverted power dome” on the hood. The grille gets larger openings to provide for maximum engine cooling, while a deeper air dam is added to deflect air from the underpinnings for better aerodynamics. Rounding out front fascia changes are gigantic headlamps, which Ford says are the largest ever on a Super Duty. The “bigger is better” motif continues around back with another first – the biggest Blue Oval badge ever placed on a Ford vehicle. Ford says the oval – about 50% larger than the one found on the outgoing model at 13 ins. (33 cm) across – is bolder. The new badge is garish, but not wholly out of place. It helps broadcast what the truck is all about. The Super Duty builds on a strong foundation created by its predecessors, which have had great success over the years. Scheduled to launch this month, it will be built at Ford’s Kentucky truck plant in Louisville. This is a pure work truck through and through, capable of pulling or pushing just about anything.